The public is invited to join United Way officials, community leaders, and BRUCE, the Million Dollar Moose campaign mascot, for a high-spirited ‘70s Party to launch United Way of Sumner County’s 40th Anniversary fundraising campaign! In recognition of UWSC's creation in 1977, this year's Kickoff is all about the 1970s, and we want you to be a part of it as we celebrate our 40th year and begin our efforts to raise $1 million. In addition to hearing our 2017 campaign plans from UWSC leadership, attendees will take a trip down memory lane, see the premier of our 2017 campaign video, and enjoy a complimentary lunch. 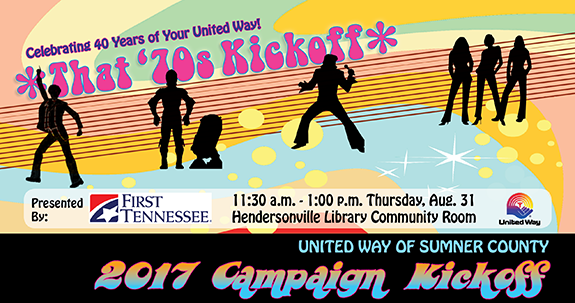 Presented by First Tennessee Bank, the 2017 Campaign Kickoff will take place from 11:30 a.m. - 1 p.m. on Thursday, Aug. 31, in the Community Room of the Hendersonville Public Library, 140 Saundersville Road. This is a free event, but we do ask that you RSVP in order for us to have an accurate count for lunch. You can RSVP online at www.unitedwaysumner.org, Email Steve@UnitedWaySumner.org, or call (615) 461-8371 to confirm your attendance by 4:30 p.m. on Monday, Aug. 28. GET INVOLVED WITH OUR FUN CONTESTS! • Naming that '70s theme song. For additional information, visit our Campaign Kickoff Website or call us at (615) 461-8371.